h. 150 W. 2nd- granary. i. 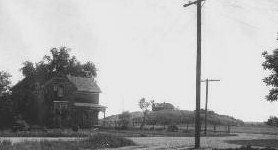 317 W. 2nd St.
c. 114 S. 2250 W.
d. 287 S. 1200 W.
YESTERDAY: Clark’s Hill in the background; George Romrell house at 253 4th St. on the left; photo courtesy Lee Romrell, circa 1910. TODAY: Clark’s Hill; in winter sledding and tubing are popular here; the hill is part of the Romrell Park and connects to the 4th Street Ball Park; west side of the hill holds bleachers; photo 2011. In 1861 George Romrell bought land at 4th and Washington and built a home there. In about 1890 he sold the house and part of his property on Washington Ave. and built the house pictured above at 253 4th Street, not far from Clark’s Hill. This house is still there, and part of the surrounding land that is now in the park once belonged to George Romrell. The rest belonged to William Henry Clark. YESTERDAY: Romrell house at 253 4th St. and Clark house on the Mound; notice roads; photo c. 1910. Drawing by Fanny Romrell Oleson shows Romrell house at 253 4th St. and Clark house on the Mound. 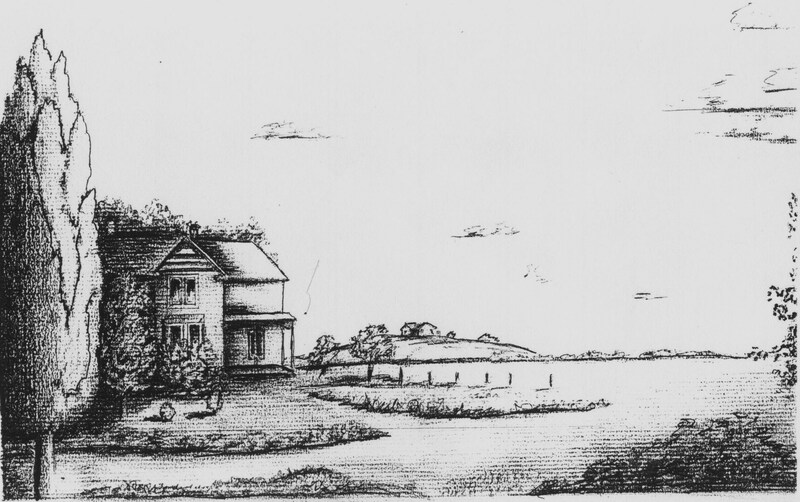 Clark’s house on the hill; detail of drawing by Fanny Romrell Oleson. William Henry Clark was born 1844 in England and was baptized a member of the Mormon Church in 1852. With his parents he emigrated to America in 1866. While in Iowa he joined the American Recruits of the Iowa Infantry and fought in the Civil War, served under the famous General Sherman and was wounded in the Battle of Shilo. His parents received an incorrect letter edged in black, informing them that their son was dead. 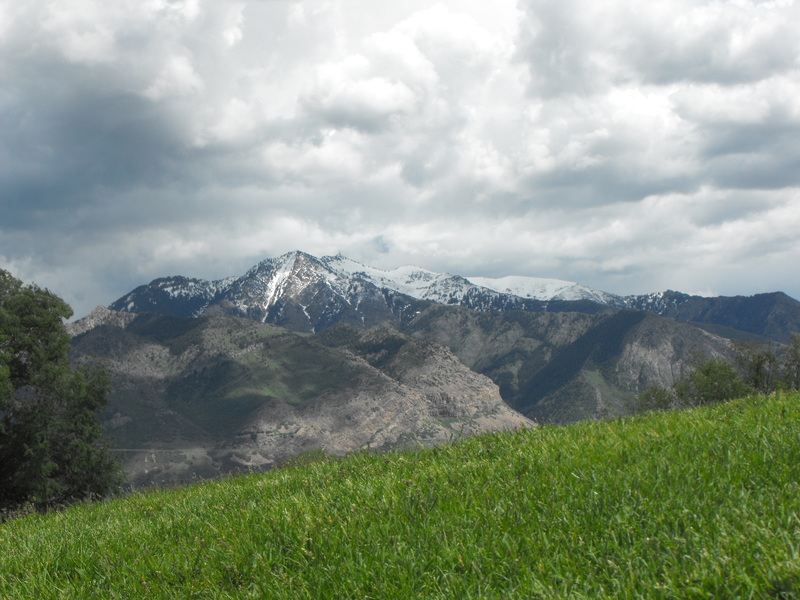 After William recovered enough to be released from the hospital, he came to his family in Utah. His father could not believe his eyes when his son returned. William married Eliza Hancock in April 1869 and Sarah Evans in 1885. 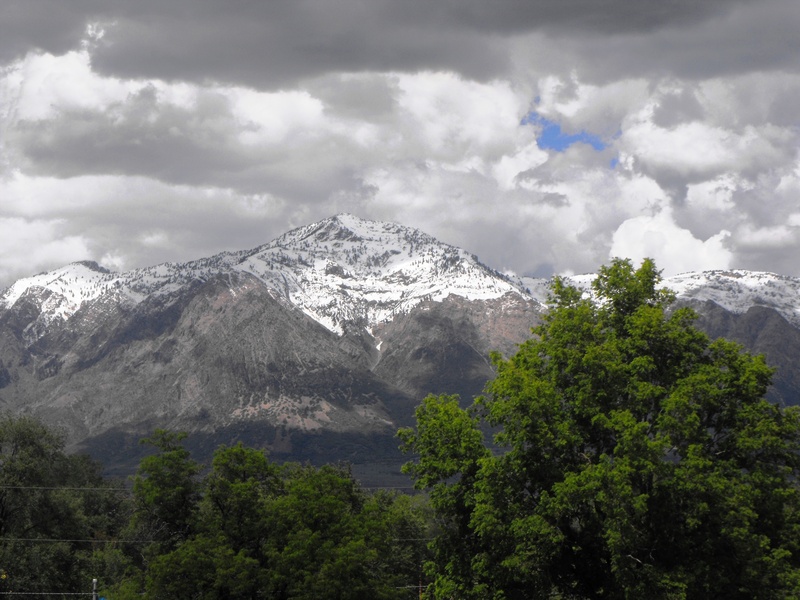 They settled in Ogden at Five Points where he obtained the Mound and some of the surrounding land. In 1885, with the help of his sons, Henry built a large white house on the Mound. It had nine large rooms. Its foundation was set on large cedar posts; it was well built of sturdy materials, and it withstood the severe east winds and heavy snow without any scars. He also built a barn and chicken coops. Here ten children were born. The house on the mound was a gathering place for community parties. Young people liked to come there for fun in all seasons, picking wild flowers on the hillside in the spring, and sleigh riding and coasting in the winter. At the foot of the hill was a pond of spring water on the adjacent Cardon property that was used for a swimming hole. Both hot and cold water came up in this spring. William Henry raised chickens and hauled freight from the rail road depot to mercantile stores up town to support his family. He died in 1905. A few years after his death, William’s wife, Sarah Evans Wilson Clark, sold the property to her son, Jim Wilson. In time Jim sold the property to Ogden City for a park. The house and buildings were taken down, and the property was made into a recreational facility. In the 1930s, Brendan James of 2nd St. use to ride his horse up to the top of Clark’s Hill to sit on top and look around. At that time there were “thousands” of lizards living there and an old well from the Clark estate. When Wall Avenue was built in about 1936, the city took dirt from the west side of the hill to make the grade for the road, thus reducing the size of the Mound. During the 1950s and 1960s Clark’s Hill was used as a stage for the 24th of July play “All Faces West”. At that time the surrounding park was known as 4th Street Park. In 1979 the Ogden City Council voted to rename the 4th Street Park Romrell Park in honor of the pioneer family who historically built the house at 253 4th Street and owned part of the land around Clark’s Hill and farm. This recognition helped to strengthen the pioneer heritage of the area. Panaramic view from the top of Clark’s Hill captures three peaks. Mt. Lewis and Eyrie Peak stand east of Clark’s Hill. Ben Lomond rises north of Clark’s Hill. Mt. Ogden lays SE of Clark’s Hill. 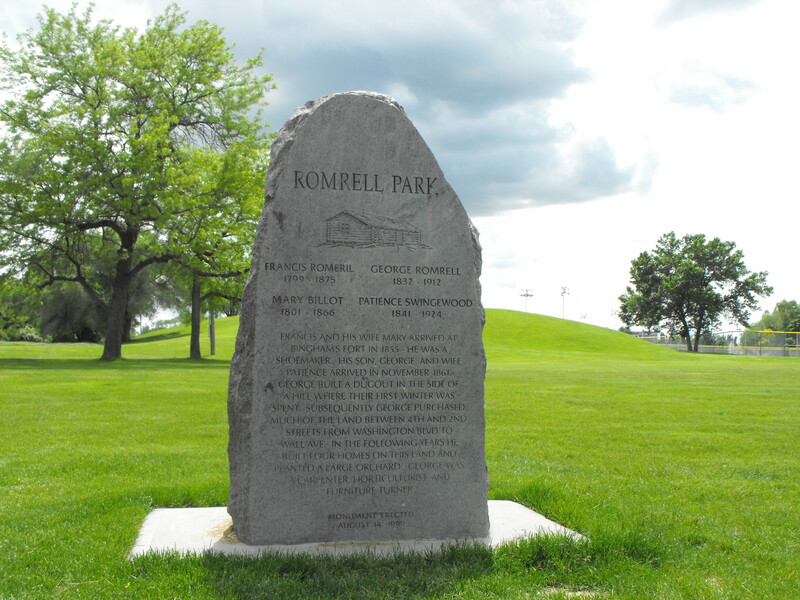 Romrell Park monument at the foot of Clark’s Hill. Dorothy Amelda Sherner and Laura Sherner Welker, Mary Elizabeth – Her Stories, manuscript, 1933, p. 50. Ogden Standard Examiner, City Favors Naming Park to Honor Family, March 21, 1979. Lorna B. Scholte, as told by Ruby Clark Blackington, Sketch of the Life of William Henry Clark, manuscript, 1982, p. 1-3; Gayle Jones, William Henry Clark, manuscript, 2003. Interview Brendan James, March 2004. This entry was posted on February 15, 2009 at 5:26 pm	and is filed under 8. MONUMENTS & PARKS, d. Clark's Hill in Romrell Park. You can follow any responses to this entry through the RSS 2.0 feed. You can leave a response, or trackback from your own site. 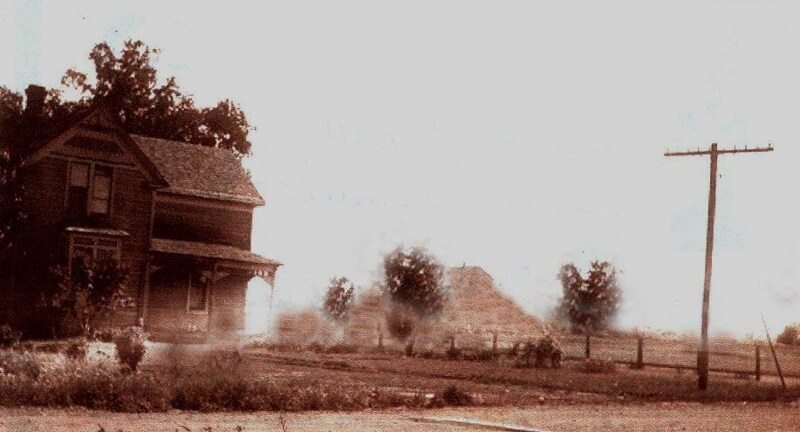 I am very interested in finding the picture/copy of the Clark House that sat on top of Clark’s Hill which is in the background of Romrell’s house. Could someone please contact me. Thank you.